Our daughter, Andrea, is suffering from Scleroderma as a result of Chronic Lyme disease. The doctors in the United States have no treatment protocols for Chronic Lyme Disease or Scleroderma so we are at a clinic in Mexico after two years of fruitless attempts to find effective medical care in the U.S . Unfortunately this treatment is not covered by insurance. As the disease progressed she became more and more incapacitated and we became extremely worried about her very survival if she did not get some kind of viable treatment. She lost a tremendous amount of weight (think skeletal), was walking with a limp and sometimes could barely walk, needed to nap several times a day and had little energy to attend to the daily needs of life although she soldiered on as best she could. The photo in no way resembles what she looks like today. It became obvious that unless we did something different she was not going to survive. The best, last option was coming to the clinic here in Mexico. The doctor here told us that we could not have waited even a few more weeks to begin treatment or her organs would begin shutting down. Unfortunately during the course of her treatment she suffered a blood clot which put her body into shock and also shut down some functions of her lungs, liver and kidneys. She is now in the Intensive Care Unit at Hospital Angeles here in Tijuana and has been for the last five days. Her condition is critical but stable. When we arrived here for her treatments we had adequate funds available due primarily to the generousity of her donors. With her admittance to the ICU we are rapidly running out of money. The cost has averaged $8,000 per day. We are trying to file a claim with Andrea and Craig's insurance company but it is slow going. The hospital doesn't have a contract with them and wants us to pay everything upfront and then get reimbursed. We are not going to be able to do that at the rate the charges are increasing. Craig wrote a check for $29,500 last night and I paid the $10,000 admittance deposit so the cost to date is $39,500 and increasing every day. The following was in the original story but I think it's important to include it again. 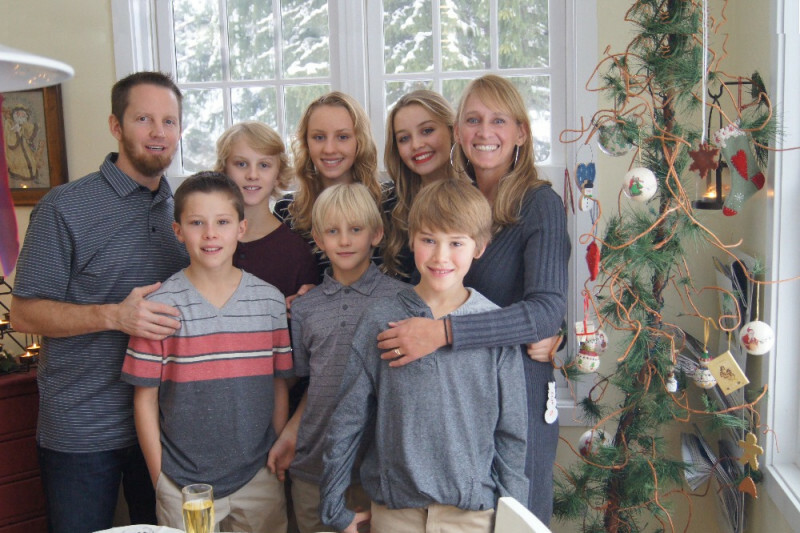 To give you some insight into what kind of people she and her husband Craig are - when our son Patrick, a 38 year old single father, died unexpectedly on Christmas Eve, 2010, she and her husband immediately and selflessly volunteered to adopt our son's two boys who where five and seven at the time. They already had four children so this was not an easy thing to do from a family integration, legal or financial standpoint. The boys have developed into smart, active, loved members of the family due to the caring, loving parentage they have received as well as from their brothers and sisters. They are truly wonderful parents and it is a beautiful family in every sense of the word. That Andrea is now infected by this terrible disease is a tragedy in so many ways. Other than funding for medical treatment we do not need other assistance, at least not at this time. The family has received substantial help from their large circle of friends in Duluth. Her husband and the children have assumed responsibility for all the things she can no longer do. They have been wonderful. All of us, her mother and I, her father and step-mother, who live in Portland, Oregon and Craig's mother and father who live in Duluth provide what help and financial assistance we can but the financial assistance we can provide as retirees is not unlimited and not nearly enough to cover the cost of the treatments she needs. We are doing all we can but it is just not enough. Additional funding is needed to cover the cost of Andrea's treatment in the ICU and whatever follows after that. Even if the insurance company covers the hospital bill, which is not assured, Craig and Andrea will be responsible for 20% of the total hospital bill. All donations go to directly to Andrea and Craig and none of the funds are used to cover our, her caregivers, expenses. Please send this campaign on to your contacts whether or not you donate. Please believe me, we wouldn't be asking for help if we didn't need it. It is difficult to have to ask for help and especially to have to ask for money. Just wanted to inform you that we have discontinued donations on this website. The campaign information will, however, remain online and you can still send comments to Craig and the kids should you wish to do so. We wish to again thank everyone for the amazing support the family has received from all of you wonderful people. We are overwhelmed by your kindness, caring and generosity. Craig asked me to post this on the GoFundMe website as an update in order to help complete the impossible task of thanking everyone for your generosity, love, kindness and compassion. We, the extended family, feel exactly the same. Our gratitude is immeasurable. "Over the past few weeks and months, I’ve been continually shaking my head in disbelief over the generosity that people have shown. Scores of kind souls have taken the time out of their days to sit and reflect and compose beautiful notes, cards, letters, texts, and social media posts about Andrea and our family. I’m further amazed by the number of those people who hardly knew Andrea or only met her once or twice. Common themes include: her positive energy, her warmth, her “10,000 watt” smile, her enthusiasm, her beauty “inside and out”, her ability to reach out to strangers and make them feel welcome and important, her passion for her family and parenting, her intellect, her creativity, her spontaneity, etc. So obviously I have been truly blessed not only for my years with Andrea but also for my relationships with the network of friends and acquaintances who are a part of Andrea’s world. So I’ve tried to thank people and I would love to write you all thank you cards but I literally have thousands of people to thank. The GoFundMe alone has over 800 donations. That’s not to mention all of the cards that we have received in the mail, at the funeral, etc. Dozens of people have brought us meals and other gifts -- someone even handed me a gift card while I was grocery shopping with Henry that more than paid for our groceries! This has certainly made life easier and has removed the stress of immediate financial burdens during this difficult time. In spite of our tragic loss of wife and mother, I still feel blessed for the past, present, and future. I’ve had a wonderful life so far and the kids and I have much to look forward to as we try to live our lives with the spirit of Andrea guiding us along the way. We will be OK thanks to all of you. I thank you with all of my heart. Andrea's funeral Mass yesterday was beautiful. The turn out was so very touching, standing room only, and we thank everyone who could and did attend. Many people flew in for the Mass from all over the United States. The love for her and her family was very much evident and the support of the Duluth and Hermantown communities is beyond description... and that support continues. We want to thank Emily Larson for the beautiful eulogy ... so heartfelt, so perfect, so Andrea. Also thanks to Mark and Christie Slattengen for dropping everything and coming to Mexico. Mark and Christie and Mark's brother Nate were very helpful in getting things done and smoothing the way for Craig and Andrea's eventual return from Mexico. Nate, a Foreign Service Officer at the U.S. Consulate in Tijuana was very helpful in providing advice and documentation. Last, but certainly not least, we want to thank Laura Ness for coming to Mexico. Andrea loved her visit and loved Laura. I'll never forget Andrea and Laura lying next to each other on Andrea's bed in her hotel room, talking and cuddling. Besides being very close friends they spent years together researching Lyme Disease and trying to find cures. We also want to thank Julie, Christi, Collen, Jason, the staff at St. Lawrence Catholic Church and everyone who participated in the service, the music, beautiful songs sung...the list goes on and on... everyone who helped organize the Visitation, Mass and reception. I know there are many, many more to thank but there were so many people in the church helping I couldn't keep track of every one. Please know that we are very thankful for everyone's efforts. Andrea would have loved it.....in fact I believe she did as her spirit is with us. She is free of the pain and the agony of the disease and her frustration in not being able to live as she always had, vivacious, energetic, always on the go. So full of love, joy and reveling in the love of her precious family and the companionship of her many, many close friends. You all meant so much to her. Obviously this was not the outcome we had hoped for but Andrea was adamant about going to Mexico. We all knew that was her last, best hope for recovery. She was indeed improving before the blood clot resulted in her admittance to the hospital. We knew at that point that it was only a matter of time but we continued to hope that the doctors would be able to stabilize her and improve her organ functions. Craig arrived the day after her hospitalization and they were able to spend their last week together. Craig's devotion and love for Andrea was very, very touching and Andrea wanted him next to her at all times. Their enduring love and trust in each other was very clear. As I have said before he only left her side if he absolutely had to and and slept next to her bed on a recliner every night. Unfortunately recovery was not to be and at the end Craig knew that even if she partially recovered she would not have wanted to live such a restricted life. The night before her last day he said that he couldn't bear to watch her suffer so much and was ready to let her go. We, Barbara and I and Ed and Josephine, agreed. She passed away peacefully the next night. Please accept the heartfelt gratitude from the entire family for your generosity, compassion, kindness and the continuing support from each and every one of you. Craig, children Sophie, Addie Jo, Sebastian, George, Elliott, Henry, mother and step-dad Barbara and Gary, father and step-mom Ed and Josephine, Craig's mom and dad, Barb and Lynn. For everyone who will be attending the service tomorrow there will be empty photo boards available. Please bring photos of Andrea, the family and friends for keepsake albums. You will also have an opportunity to write memories of your friendship with her.